The Argentinian government is investing heavily in infrastructure, hoping to win over sceptical voters. 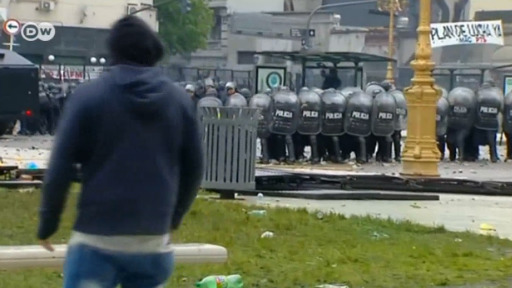 Protesters in Buenos Aires have clashed with police in front of Congress to protest cuts to the 2019 budget bill. Argentina's President Mauricio Macri needs those cuts as he has committed to balancing the budget. The arrests came after one bomb exploded in Buenos Aires and another was thrown at a judge's home. Authorities say security is at "maximum alert" in order to avoid disturbances to the upcoming G20 summit. World leaders have wrapped up the first day of talks at the G20 summit in Argentina, where divisions over trade and the Russia-Ukraine conflict dominated discussions. The US was taken to task for blocking progress.